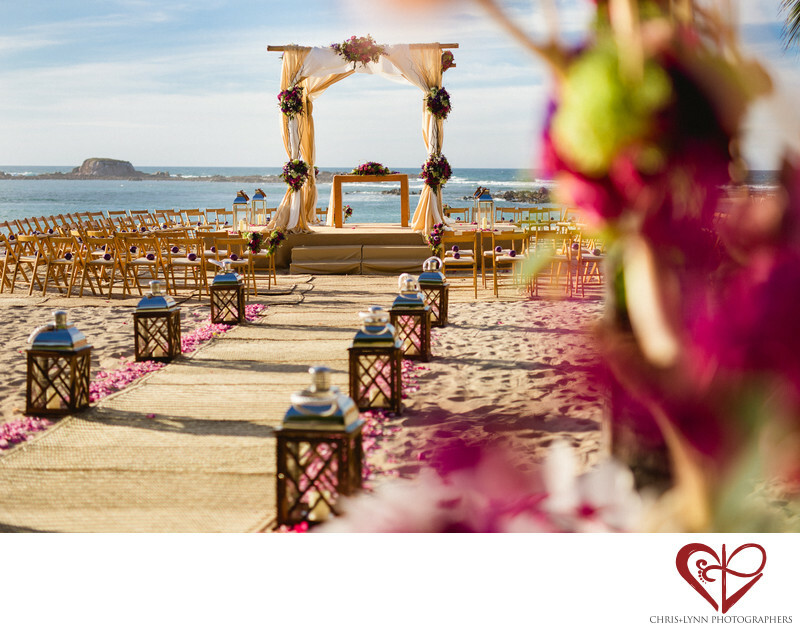 The St Regis Punta Mita is one of our favorite venues for a Mexico destination wedding. The setting, privacy, and service at the St Regis is unmatched! The location has multiple places for different events on site making it a great choice for multi-day weddings that include a Welcome Party and Rehearsal Dinner in addition to the actual wedding day ceremony & reception. This beach wedding ceremony had a design that combined classic elegance with a Mexican beach vibe. Lanterns of metal, glass, and wood lined the processional and local florals of a deep magenta and rich fuchsia added color. The huppah, handcrafted from local tropical wood, was surrounded with rows of chairs in concentric circles, allowing all 200 guests a view of the couple as they said their vows. On each chair was a custom-designed maraca to shake during the breaking of the glass and the kiss. With breathtaking views of the ocean, sky and the distant Marietas Islands, Mexican wedding designers Landa Weddings wanted to enhance but not overwhelm this ceremony location. The end result is one of our all-time favorite Mexico wedding ceremony set ups. Location: The St. Regis Punta Mita Resort, Carretera Federal 200, km 19.5, 63734 Punta De Mita, Nayarit, Mexico . 1/4000; f/1.8; ISO 100; 50.0 mm.